NPR reports on what 45 says verbatim. However, NPR also has liberal humor and commentary - but NPR is clear about which is which. Shows like Wait Wait... Don’t Tell Me! are advertised as comedy programs and not actual news from the start, while programs like Morning Edition is advertised to be actual news and Fresh Air is advertised to be a talk show, and neither are comedy. Organizations such as Fox News do not do the same - they blur the line of journalism and commentary, such as with Sean Hannity [Note 2], combining facts and opinions for those who are unaware of the difference (note: there is a misconception that Fox News sued for the right to lie - this is false. It was an editorial dispute that was taken out of context). NPR is fact-based, reality-based, and has to remain so. In the end, it seems that reality has a well-known liberal bias, and NPR just reports on reality. In order to answer your question, I think we have to calibrate your propaganda meter, by which I mean: figure out your definition of that word. If something unflattering is reported about President Trump, is it automatically propaganda? If something unflattering is reported about President Trump, but it happens to be true, is that automatically propaganda? Can an item that is reported about President Trump, but that is flattering to him, be propaganda? True or false: President Trump’s inauguration crowd was much larger than President Obama’s. True or false: President Trump has made more statements that are verifiably false than any President since the advent of modern media. Does Fox news ever employ propaganda when it reports on President Trump? If you can answer those questions, I think we’ll have a much clearer idea of what you mean when you say propaganda. Answers will undoubtedly follow. This is important to remember, especially as NPR’s financing is public information. 14% of its fundings comes from state and local governments, 20% from corporations, and 37% from individuals [Note 3]. All of this can be independently researched. Military surplus, polygamist, jerky-making (3 words, +9 points). With the 78 words, there is a total point value of -45. To see where we lay on the chart in this article, we have to take the total point value and divide it by words used - in my case, -45÷78, which equals -0.58.That puts me just left of the center-line. 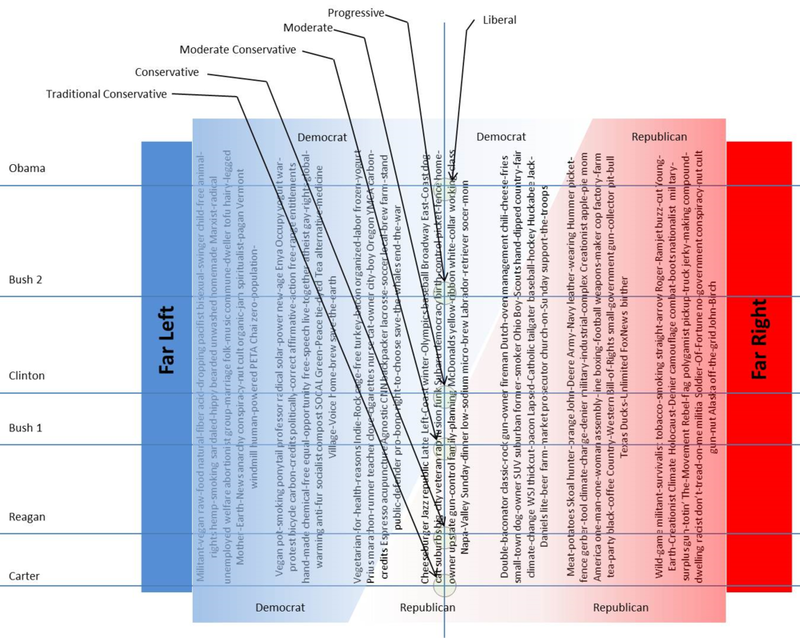 Under Carter (Centrist Democrat), I'd be a Traditional-Conservative Republican. Under Reagan (Libertarian Republican), I'd be a Traditional-Conservative to Conservative Republican, changing to Democrat. Under George H.W. Bush (Conservative Republican), I'd be a Conservative Democrat. Under Clinton (Centrist/New Democrat), I'd be a Moderate-Conservative Democrat. I’m not too surprised at this, personally. Conservatives of days past were our physicians, engineers, scientists, and professors - the people whom we now see as flaming liberals. Universities, once the place where we went to further the education that was seen as being for the greater good, are now seen as the bastion of the liberal elite. But we’ve had the Reagan Coalition, more openly queer relationships, and increased racial and gender diversity. We’re in the age of the new normal, where actual Nazis are being seen as something to tolerate, where Alex Jones and Gwyneth Paltrow sell products that should never be ingested and people believe them, where people are equating NPR with Occupy Democrats and Breitbart [Note 7], and where Fox can make either False or Pants on Fire statements 39% of the time with little-to-no consequence (as a contrast, CNN only makes the same kind of statements 18% of the time). I refer to the current president as 45 instead of by name - initially, it was because it was a form of shade. During the lead up to becoming president, he was the public face of hatred and bigotry, and therefore was beneath being named in public discourse. Now, as president, his intense narcissism and his continuing attempts at hiding the fact that he is poorly informed and brash makes it unpalatable to put any power to his name directly, or to link his name to the office that he holds. However, to not specify that one is talking about him is also dangerous, because he is dense enough to not understand that he is the one being talked about, and his adherents can, and have, chalked up criticism that didn’t have his name attached to it as being general political rancor. Hence, to be direct, I call him 45, or the 45th President of the United States. Let’s just hope that he’s not also the final president of the United States. Unfortunately, I am not one of these individuals, as I cannot afford to help fund NPR at this point in my life. However, I would love to, and plan on it when I have the finances to do so. I’ve been working on a series called “The GOP is not the Party of Lincoln - A Brief History” - check out Part I (Whigged Beginnings) and Part II (Progressive Boogaloo). Check out this excellent video from VOX: How Trump makes extreme things look normal. If you enjoy this and want to help me out, you can do so by clicking the link to Patreon to help me out on a monthly donation, or click the links to PayPal or Square Cash for one-time donations. And also, just share these posts! I would love to reach a wide audience and touch many lives. Newer PostMarsCon 2018 starts now! Older PostA Rebuttal to EC Henry's video "How ONE LINE Fixes The Last Jedi"